Why are there so many species and what determines their geographic distributions? How have morphological features evolved over geological time, and how has ecology shaped the evolution of these features? How can we best protect some of the least well-known components of biological diversity (e.g. land snails)? These questions underpin my research program, which is focused on the determinants of species diversity: phylogeny and biogeography, as well as understanding the contributions of speciation in community assembly. I use a pattern-based approach to investigate evolution across different levels of time and space, incorporating molecular (i.e. DNA sequencing, phylogenetic data analyses), morphological (e.g. scanning electron and light microscopy, mapping characters onto phylogenetic trees), geographical and ecological data (e.g. island locality, habitat type, food preference) to understand the series of overlapping events involved in the development of biota over time. Species richness is highest among small organisms; I think we should increase efforts to understand how some of Earth’s most diverse animals diversified. I have thus far focused on species and geographical regions that are under-represented in the scientific literature: A) “micro-” land snails of Pacific islands and B) meiofaunal marine invertebrates (i.e. minute metazoans living between sand grains) of the Pacific Northwest and Hawaiian Islands. I am currently expanding this work to include New York State species. The challenge in reconstructing the evolution of many inconspicuous invertebrate animals is that most species are undescribed, and basic natural history information is often completely lacking. The potential reward is discovering previously unknown patterns of diversity and novel lines of inquiry. Conservation is at the forefront in much of this work, since many of my study subjects (e.g. Pacific island land snails) are among the most endangered animals on Earth. My data are being used through collaborations with local (Palau Conservation Society) and international (IUCN) conservation agencies (e.g. 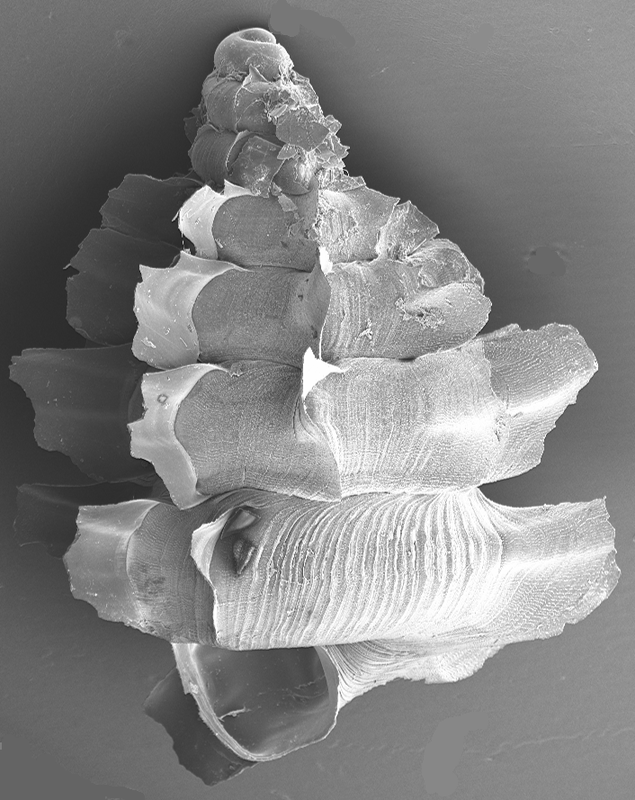 see IUCN Oceania report featuring land snails here). The western Pacific Belau archipelago (Republic of Palau, Oceania) comprises 586 islands, most of which have suitable habitat for the endemic limestone karst and leaf litter dwelling diplommatinid land snails. 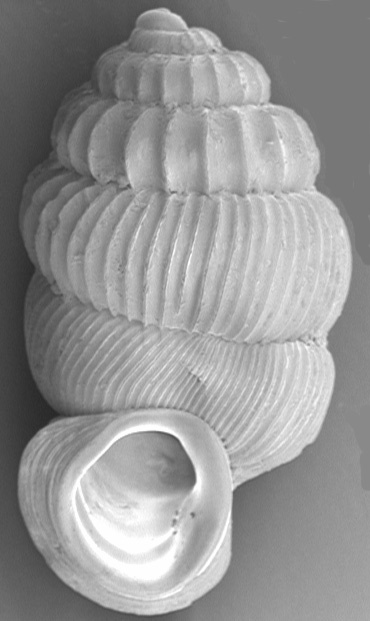 Diplommatinids are small-bodied (< 5 mm shell length), display a huge array of shell morphologies (e.g. different spine and rib morphologies, e.g. see above), and are incredibly diverse. These snails exemplify the pattern that most of Earth’s diversity is among the small: of the estimated 200 land snail species in Belau (based on my survey work there) I uncovered 81 diplommatinid species, most of which are undescribed (Rundell, 2010). These species are thus a new vehicle for examining the ecology of major diversification on Pacific islands. Using morphological and ecological data mapped onto molecular-based trees, I discovered that general shell type (heavily calcified or globose) and habitat preference (rock or leaf litter) evolved early among diplommatinids, followed by subtle differentiation in either the globose ribbed or calcified and conical phenotypes (Rundell, 2008). Within the latter calcified, rock-dwelling clade, spined morphologies evolved more than once—interesting convergences that warrant further investigation. Many Pacific island terrestrial biotas are known for both species richness and morphological diversity reflecting obvious ecological differentiation. Less well understood, and perhaps just as common, are those radiations comprising species that exhibit little ecological differentiation. Using phylogenetic and biogeographical evidence (based on nDNA (nuclear) and mtDNA sequences of Belau and western Pacific land snails) in combination with ecological data (i.e. rock or leaf litter) and shell morphology (i.e. heavily calcified [rock dweller] or ribbed [leaf litter dweller]) I am investigating the evolution of ecologically similar species among Belau islands. (a) Classic view of adaptive radiation (ecological opportunity coincident with colonization, sympatry rapidly achieved; (b) nonadaptive radiation (allopatric species, no ecological opportunity; (c) as in (b), but species ecologically differentiate later (e.g. due to climate change) (Please see Rundell & Price, 2009 for definitive version; Trends in Ecology and Evolution; Elsevier). Adaptive Radiation, Nonadaptive Radiation. . . Given that some biotas are composed of many [seemingly] ecologically similar species, are "nonadaptive" radiations more common than we think? How does the timing of splitting events and ecological differentiation fit into our understanding of the development of a particular radiation? There are a few documented cases of nonadaptive radiations (e.g. 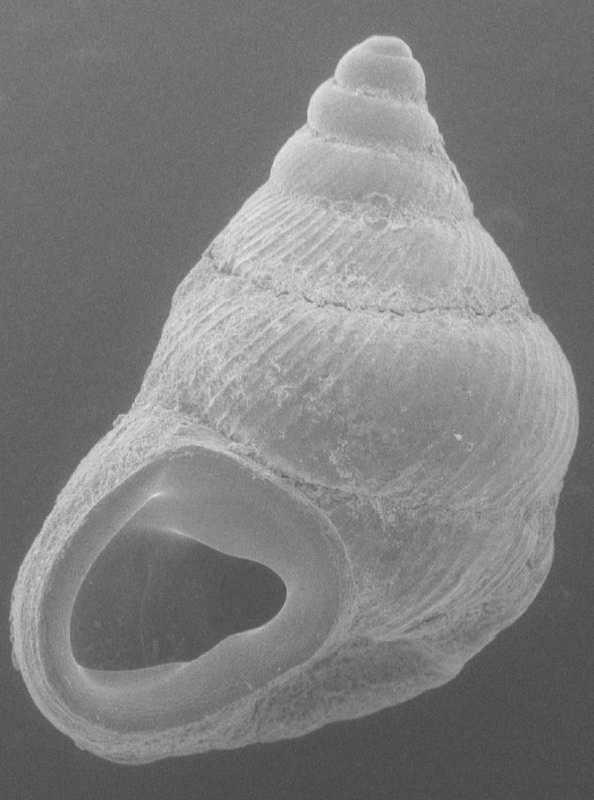 Hawaiian achatinelline tree snails: Rundell, 2011), wherein lineage diversification occurs with minimal ecological differentiation, resulting in taxa that are allopatric or parapatric (Gittenbereger, 1991; Rundell and Price, 2009). So-called adaptive radiations are better known, but did ecological differentiation co-occur with splitting events? It seems clear that patterns we currently recognize as adaptive radiations might mask nonecological processes underlying the formation of those biotas. In other words, species could have arisen through geographical isolation and nonadaptive radiation, and only much later differentiate ecologically and spread into sympatry (Rundell and Price, 2009; above). Currently we are investigating ways to test this idea. 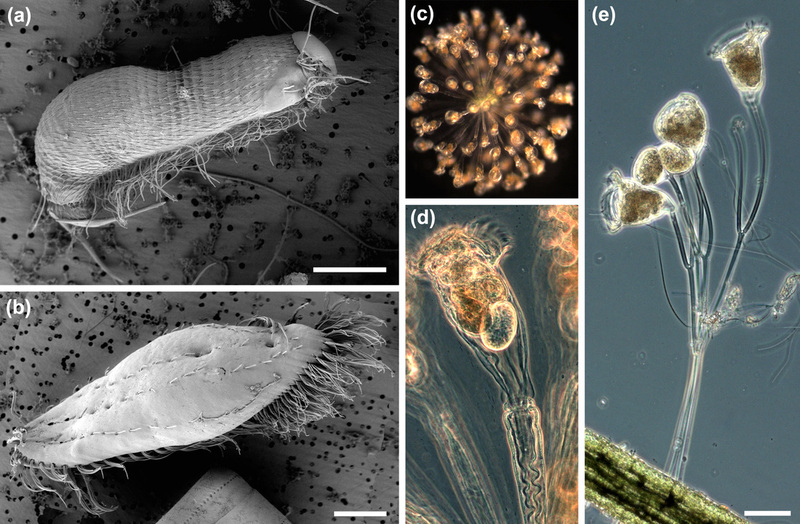 Marine Meiofauna: "Masters of Miniaturization"
Convergent evolution between (multicellular) animals (a: gastrotrich, c, d: stalked rotifer) and (single-celled) ciliates (b, e) (from Rundell & Leander, 2010, BioEssays; Wiley-VCH Publishers). Meiofauna include micro-metazoan species and micro-eukaryotes between 60 µm and 2 mm in length, living between sand grains (i.e. living in interstitial spaces, rather than burrowing through sediment). Meiofaunal species generally possess a common suite of adaptations to their extreme interstitial environment (e.g. vermiform body, profuse ciliation, armor, adhesive glands). We found that such adaptations are common between metazoans and single-celled eukaryotes, to the extent that such species appear nearly identical and have similar body sizes (Rundell and Leander, 2010). While metazoans are reaching their smallest body sizes in the interstitial realm (indeed, several lineages are completely meiofaunal), unicellular eukaryotes are reaching larger body sizes than their relatives. The study of miniaturization among these putative “masters of miniaturization” has been neglected; we provide a framework for future inquiry in this field. Meiofaunal research is in its infancy. New species discoveries for some groups represent huge gains in our knowledge of these microscopic organisms (e.g. new species of entoproct, a phylum with under 200 described species; Rundell and Leander, 2012). Perhaps among the most poorly known of these groups are the “Platyhelminth” flatworms. It is therefore perhaps unsurprising that we have discovered a wealth of undescribed species, many of which are geographically restricted—a pattern not unlike those found in terrestrial systems. Such discoveries are not ends in themselves—they are helping us establish novel systems for investigating the role of geographic isolation in marine speciation, as well as providing examples of how species might accumulate through time. We reconstructed the first phylogenies for two groups of these worms from the Pacific Northwest, illustrating their morphologies with light microscopy. This provides a foundation for exploration of morphological diversity and convergence in these groups. Parallels can also be drawn in the ecology of diversification among minute species, using diplommatinid land snails and microscopic marine flatworms as model systems. I am collaborating with Mike Barker’s Lab at University of Arizona on a diversity of questions, including bioinformatics and genomics projects involving understanding the frequency of “abrupt” speciation events, such as those resulting from whole genome duplication, in plants and animals. How have such events impacted diversification patterns evident today? Please check out the links under the "Conservation" tab to explore some of the areas in which we are working. If you are an undergrad or prospective grad student interested in conservation-focused projects, please check out the Lab Members page, the Join Us page and/or contact me.